We may already be past the point of no return for the industrys nascent train wreck: the advisor shortage. Plus, the bear-market wild card. This is the third in a three-part blog series that looks at the top issues advisors will face in 2014. In part one, we explored what may be next for ‘robo-advisors.’ In part two, we looked at the regulatory issues that may othr not be resolved this year. In this post, we will look at the challenge of demographics for the industry, and conclude with a discussion of how a bear market, especially in bonds, could affect the industry for good or ill. The impact of “demographics” on advisors is certainly nothing new, nor is the point that the average age of advisors continues to rise every year, with not nearly enough newer/younger advisors coming in to replace those who are retiring. But 2014 may finally mark the year when we really begin to take notice of the problem. As with the proverbial “boiling frog” in the pot that never realizes when to jump out as the temperature rises, the reality appears that we may already be past the point of no return for the industry’s demographic dilemma. Instead, the only question is how the shortage plays out until the situation rectifies itself. In fact, estimates from Cerulli (see chart below) suggest that the number of financial advisors may have already peaked prior to the financial crisis, and has been in a steady decline since then. This trend is anticipated to continue as more and more baby boomer advisors reach retirement age and the industry attritions a net of about 2% of advisors per year through 2017. 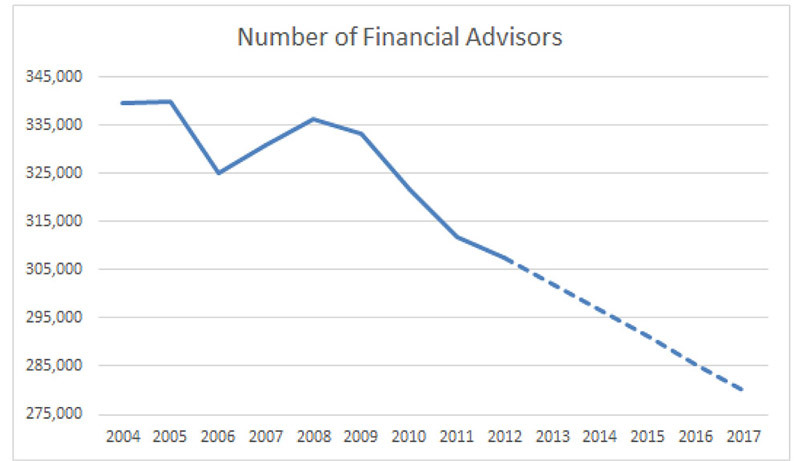 Of course, not all “financial advisors” in the Cerulli data are providing financial planning, and overall the number of CFP certificants continues to grow. Nonetheless, the rate of growth for CFP certificants is slowing as well, as the chart below shows, suggesting that the aging of the advisor population and the increase in retiring advisors is beginning to take its toll there as well. 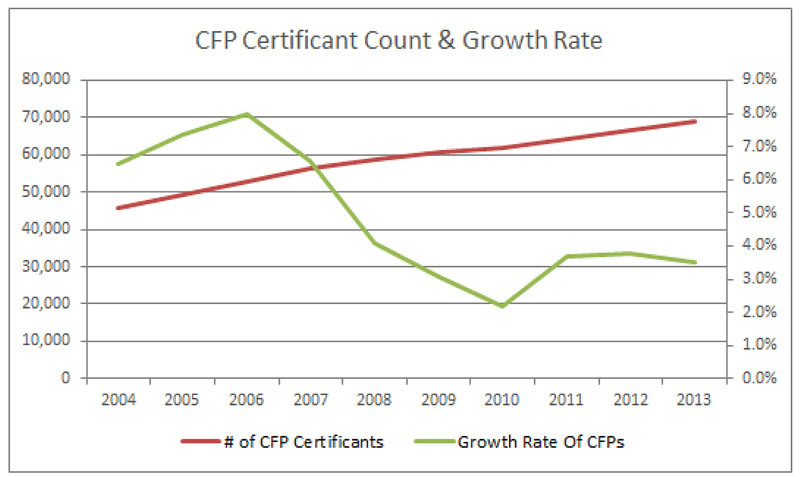 In fact, as the CFP Board’s own certificant demographics data reveals, there are currently more CFP certificants in their 70s than there are in their 20s! Of course, given what is still a relatively modest attrition rate, it’s not likely that there will be any sudden catalyst in 2014 (though an ‘unexpected’ bear market that puts pressure on a large number of advisory firms could accelerate the trend—see bonus 2014 outlook below). Moreover, as I’ve noted in the past, it’s not entirely clear if advisors are even going to exit as quickly as anticipated, or if a rising number of veteran advisors will simply decide to convert their businesses into “lifestyle practices” and let them wind down slowly throughout their later years (which means the ‘great exodus’ of advisors could be less about retirement and succession planning, and instead more about holding practices until death and ‘final exit’ planning). On the other hand, the pace of baby boomers retiring from the advisory industry may accelerate now that the earliest baby boomers will be turning 70 in 2014. The New Age of Employee Advisors? Nonetheless, the fact that baby boomer advisors may be retiring more slowly than once anticipated doesn’t resolve the underlying problem. That is, there is a dearth of new advisors who actually have capacity to take on new clients, coinciding with a stage of industry growth where firms are getting larger and larger and are increasingly looking to hire “employee advisors” who have capacity for client growth. In the emerging “age of employee advisors” a veteran advisor at capacity with a lifestyle practice may as well be retired for a firm that’s looking to hire. So from a practical perspective, the dearth of advisors is about to become most noticeable within firms that are actually growing and trying to hire more financial advisors for capacity. Whether trying to hire a newer financial planner or an experienced one, we’re seeing this trend play out in our recruiting businesses. The trend is also becoming apparent in the Moss Adams benchmarking surveys, which are showing upward pressure on compensation for experienced “lead” advisors that can be responsible for client relationships. Of course, what may be a shortage of talent for firms that want to hire also paints a remarkably positive outlook for any newer advisors looking to enter (or who have recently started) in the business, as the dearth of younger advisors and competition for top talent should help to lift the financial benefits of a financial planning career in the coming years. As the number of advisors falls down towards multi-decade lows, the squeeze for talent and the industry’s demographics problems are going to become noticeably worse. Ultimately, this will put upward pressure on the compensation of advisors that helps to rectify the problem as the supply eventually rises to meet the demand, but not without a significant lag. That means the problem is likely to get worse before it gets better. While the aforementioned issues in this blog series will play out throughout 2014, the reality is that the biggest potential issue for all of 2014 is also a total wild card: the next bear market in stocks and bonds, which may or may not occur in 2014. It seems presumptions to just “call” a bear market for 2014 without a catalyst. Not that all bear markets even need catalysts, but there have been no shortage of potential stock and bond bear market catalysts in the past several years which haven’t come to fruition. It would be remiss not to acknowledge what a significant impact a prospective bear market could have, in part because of how it may interrelate to the other trends underway. On the one hand, a sharp bear market could spell the early demise for a number of robo-advisors (see first blog in this series). If a severe bear market takes 25%-35% off robo-advisors’ asset bases (bearing in mind most are very equity-centric due to their relatively young clientele), and they experience client attrition that chops their revenue by half or more, the funding for robo-advisors will likely dry up altogether. That’s funding either for new entrants into the space or additional funding for existing entrants. While this scenario doesn’t mean the “robo-advisor threat” will vanish altogether in a bear market (the few that survive may grow even stronger as they learn from their experiences), it would likely put a pall on the space for several years, potentially giving advisors some breathing room to catch up. On the other hand, a bear market will likely hit traditional advisors quite hard as well, as it always does. The impact may be even more noticeable this time around, though, as the ongoing transition of financial advisors to AUM practices will provide a stark reminder of the importance of having a sufficient profit margin in the advisory practice to absorb the consequences of a bear market and its revenue impact. While a firm with $20M of AUM can often grow enough new clients to replace the lost revenue in a bear market, it’s much harder to do with $200M under management, and virtually impossible for all but a few super-fast-growing-firms with more than $500M of AUM. While this doesn’t necessarily mean that the AUM model is a “bad” one, it will be an important reminder that such businesses much be managed over the entire economic cycle. That may slow the pace of hiring, as well as the pace of practices being sold, as few want to sell their businesses at the bottom of a market decline. On the other hand, for a number of advisory firms that were only marginal in the first place, a bear market may simply put them out of business altogether, leading a number of veteran advisors to simply walk away from their practices and retire at that point. However, a bear market, especially in bonds, would have some benefits. While low interest rates have had a pervasive negative effect on the industry, and rising interest rates may be bad for bond prices, and the housing market, they’re actually good for the profitability of many other parts of financial services. For instance, higher rates will give room for money markets to pay a decent yield, but also for money market providers to finally earn a spread again. So in the event of a bear market, expect to see an explosion in the profitability of the RIA custodian business as providing money markets becomes profitable again. Rising rates will also provide some welcome relief to much of the insurance industry, as everything from secondary-guarantee universal life to long-term care insurance has suffered mightily in the extended low-return environment; higher interest rates should dramatically slow the pace of premium increases. While it’s hard to know whether the next bear market will really come in 2014 or some point down the road, the next one that comes—especially since it may be a stock and bond bear market simultaneously—could be very disruptive for today’s advisory practices, especially if they are not run with an appropriate margin of safety. At the same time, though, higher rates may be a boon for other parts of the financial services industry.